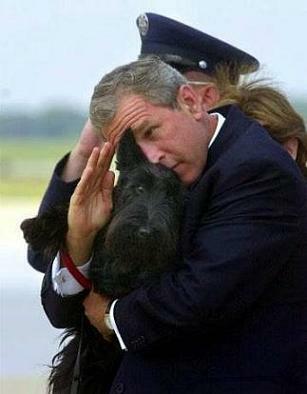 Just as predictably, some liberals responded with this similar image of former President George Bush during his presidency. But most people, both liberal and conservative, missed the point. 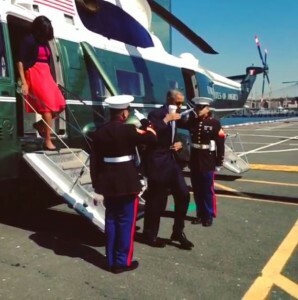 Though neither Obama, nor Bush gave a proper salute, I give them both the benefit of the doubt that neither man meant to be intentionally disrespectful. It’s a perfectly fair and reasonable assumption that doesn’t require one to like either man nor agree with their politics. More to the point, it’s a minor issue in the grand scheme of things. We can’t allow the media to manipulate us into getting all worked up over minor matters that distract us from paying attention to the major matters that should concern us. The media gets off on stirring up crap and fanning the flames of the “Us vs Them” mentality. And, all too predictably, too many people fell for this tactic, hook, line, and sinker. We need to stop falling for this kind of distracting and divisive nonsense and stop making mountains out of molehills. Imagine what could be done if people got this indignant about things that really matter.